Last night I had a delightful evening with my wife in one of the best places on earth, the Fort Greene neighborhood of Brooklyn, New York, where we snacked on delicious Haitian-style hors d’oeuvres and sangria at the La Caye Restaurant and Bar before going to see the new movie Belle at the Brooklyn Academy of Music, or BAM, as it’s commonly called. If you haven’t seen this movie already, you should. The film, directed by Amma Asante, is a period-piece drama that critics (e.g., [here]) have compared to the many adaptations of Jane Austen novels such as Ang Lee’s Sense and Sensibility, except that unlike the usual period-piece fare, the heroine of this film, Dido Elizabeth Belle, is biracial, and also unlike the usual period-piece fare, woven into the romance plot is the court-room drama concerning the infamous massacre of 132 human beings on the slave ship Zong. 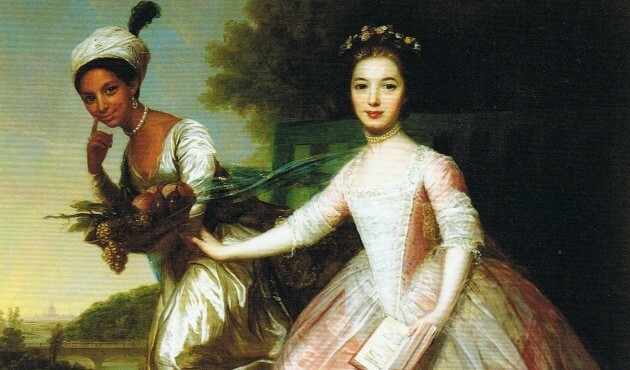 The film is important for its foregrounding of very important historical events that are somewhat unknown to the general public, as Dido Elizabeth Belle was a real person (as the famous scholar of African-American literature Henry Louis Gates, Jr. has written about [here]), and the infamous Zong case was an event so horrible that it challenged one of the most important foundations of the transatlantic slave trade — a foundation that few think of when they think of slavery — insurance. I am hoping to do more research on the historical details behind this film, but since this movie is also a work of fiction and a speculative interpretation of history that aims to explore the complex emotions of its characters, I agree with critics such as Sheryl Estrada and Dodal Stewart who note that the movie is also worth seeing for its imaginative and narrative qualities, for its relevance to conversations about the ambiguities of racial identity in our world today, and for how young women of color see their potential illustrated in cinema. The movie usefully connects with a considerable body of literature. As the director has discussed in an interview with NPR [here] and as an article in the Guardian [here] discusses at length, the movie was inspired by the portrait of the real-life Dido Elizabeth Belle and Lady Elizabeth Murray and resonates for historians with a recently published biography of Belle’s guardian, Lord Mansfield, who was the judge deciding over two important legal decisions about slavery, the Somerset and Zong cases. What the director of the film and critics neglect to mention are the many other recent literary works about the Zong case, including a book of poems by M. NourbeSe Philip entitled Zong! (published in 2011), a novel by Fred D’Aguiar, Feeding the Ghosts (published in 2000), and an influential work of cultural theory by Ian Baucom, Specters of the Atlantic: Finance Capital, Slavery, and the Philosophy of History (published in 2005). What the director and film critics also neglect to mention is how much this film connects with what is now being taught in college seminars on eighteenth-century American and British literature, notably the now canonical autobiography of Olaudah Equiano, who was a former slave and successful businessman and who also happens to be the individual who first brought the Zong case to public view, and the novel A Woman of Colour, a Jane-Austen-like story about a biracial heroine originally published in 1807 (four years before Jane Austen’s first novel) and only just recently rediscovered and published in 2007 in a well-researched edition that uses the portrait of Dido Elizabeth Belle as the cover art. I also think many of the critics (even Henry Louis Gates) who focus entirely on the simple historical fact of black presence are missing what is truly interesting about Belle — and also what is interesting about the movie that received far more attention last year, 12 Years a Slave — and that is the ways the movies reveal the troubling and complex legalities of property, debt, and insurance. In fact, in many ways, although the mainstream media critics wrongly asserted the groundbreaking uniqueness of 12 Years a Slave (as I discussed at length in this blog a few months ago [here]), which for the most part was pretty much the same story that people have been telling about slavery since the 1850s when the book was published, that movie was somewhat unique for showcasing how slaves were part of a network of debt relations. The best scene in 12 Years a Slave is, unfortunately, a scene that is not given enough explanation and context, and that is the scene when the slave’s life is protected from violence simply because he is the property that secures a bank loan. In many ways, Belle is a more unique and interesting film not just in the way it presents a more complicated portrait of race relations in the eighteenth and early nineteenth centuries than the racially and morally black and white movie 12 Years a Slave, but also in the way that it focuses more intently on the peculiar legal history of the insurance industry that underpinned the slave trade. The Zong case was a case of basic insurance fraud, as the owners of the slave ship claimed they had to throw the bodies overboard to protect the ship and so demanded compensation from the insurance underwriters; the underwriters argued that the ship’s captain did not need to kill the slaves and that he did so deliberately in order to collect the insurance money. Significantly, what was not a legal option for the court to decide at that time but nevertheless was repeatedly commented upon during the trial was the morality of treating human beings as little more than insurable cargo. Without insurance, such far-flung capitalist enterprises such as the slave trade would lack the financial backing to be so prosperous and also so entangled in every aspect of the modern economy. As Ian Baucom’s work of scholarship on the Zong case that I mention above points out, the slave trade may today be illegal, but many of the legal structures governing the economic system that emerged from it remain. This presents us viewers with a more complicated picture, which is why I think the movie Belle deserves far more attention than it seems to me it has received. What is also very compelling about the movie is the growth of the characters, Belle becoming a self-assured, ethical person the more she engages herself in the court case about the Zong’s insurance claim and the more she becomes self-conscious of the confusing and unjust ambiguity of her social position. In fact, almost all of the characters (except one) appear to grow and mature under the film-maker’s speculative interpretation of history. In contrast to the almost pornographic brutality of abuse and incessant degradation in 12 Years a Slave, what is great about Belle is that it presents a positive image of a black woman in the eighteenth century, one who is self-assured, moral, and full of potential. In my criticism of 12 Years a Slave, I complained that neither white nor black audiences could identify with any of the characters, but in contrast, the moral and cultural ambiguities for all the characters in Belle are still with us today. To conclude, I want to further complicate and challenge how all the critics have talking about the movie Belle. As you are reading my blog and perhaps wondering about the funny title of this post, I hope you are noticing the puns I am making comparing financial metaphors with narrative metaphors (e.g., growth, potential, speculation, insurance, assurance, etc.). What is wonderful about this movie is the way it allegorizes the ambiguous double-bind of the law through character of Belle. Just as the law governing insurance and the lives of human cargo are contradictory, so are the rules governing Dido’s position in the household. The story plots the contradictory rules governing both Dido’s life and the insurance claim beautifully. As Belle confronts the legal conundrum, she increasingly abandons the “marriage market” and stays true to her principles, as well as, financially, her principle — that is to say, her inheritance that empowers her. The speculation of cinema, like financial speculation, trades on assurances that the audience’s hopes for human potential and freedom can be realized. (And if it bothers you that my deliberately playful mixture of metaphors ironically juxtaposes the noble story of Belle’s assurance with the more dismal story of financial speculation, then good, because I think that it should, as that subtext is the real strength of the movie.) I am hoping to explore this theme further in a more detailed literary analysis, so I welcome any comments, advice, or suggestions for further reading.